Tapmad TV is an online app which allows you to watch your favourite TV channels, movies, seasons and dramas with more than 140 live TV channels and hundreds of films, TV shows, documentaries etc. forming a crucial part of its offered services. The launch ceremony of Mobile TV app “TAPMAD TV” was held at the Alliance Francaise, Karachi and hosted by Ayesha Omer. The event was attended by many prominent and noteworthy TV and media personalities. The launch is expected to revolutionise the entertainment sector by bringing it closer to the consumers. TAPMAD TV is an online mobile TV app which will enable you to watch your favourite TV channels, movies, seasons and dramas in addition to more than 140 live channels. The offered service will include enhanced features such as “catch up” which will enable the audience to catch up on the missed season or program due to work commitments within the seven days of its release while the “DVR” feature will enable you to save your favourite program for later viewing. 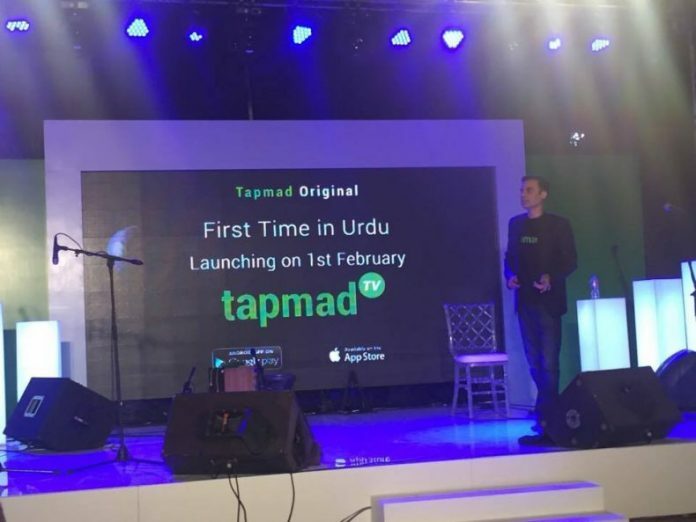 Yasir Pasha, the founder and CEO of TAPMAD feels proud that every bit of TAPMAD TV’s content is produced in Pakistan. Concerning the price details, Mr Pasha said that the online app is available for both iOS and Android models and is currently free of charge for more than 140 live channels. The premium option will be available at Rs 250/month that will allow the consumers to view movies and TV shows in HD quality.